Walmart is helping you or your kids in getting ready for college. They are doing so by giving out free k-cup coffee samples so that you can have your own coffee bar. I know coffee was what helped me get through those late night study sessions the days leading up to big exams. Having quick coffee on hand can really help you have an edge. K-cups are great because they are fast single serve coffee packs that are ready when you are. This sample is also from Walmart so they tend to go fast but you know that you will get yours. 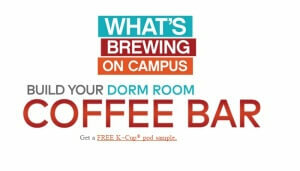 Hurry in and request your free k-cup coffee samples while they are available. The site is being swamped with request so please be patient.